What is the best cardio workout machine for home? This is the question we ask ourselves when we first plan to start working out from home using a cardio machine. So, if you are confused and are tired of reading paid reviews, then read on to find out which cardio equipment matches your exercising regime. Why Does Your Home Needs a Cardio Machine? Are Cardio Workouts The Best For You? What Is The Best Cardio Machine? Before you set up your garage gym, you need to know about the different exercising equipment to revamp. Among them, you definitely need to have a cardio machine and a Glute Ham Developer. 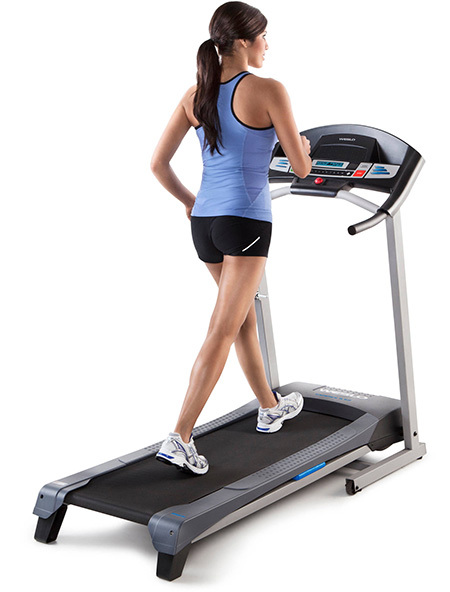 This machine is specially designed to provide cardio workouts. Cardio does amazing things for your body. A lot of people prefer cardio because they can get a much more ‘complete’ workout when compared to lifting weights. And the fact is that you don’t need to use all those fancy thinga-ma-jigs to get your cardio done, just a simple stationary bike will be more than enough to get your sweat on. Another thing that most cardio machines don’t have the drawback of being ‘impact’ exercises. This means that there’s not much strain on your joints when you perform these routines. This is perfect for people who are starting out or older people who are looking to add fitness to their regimes. Each time you use the cardio machine, your heart rate increases, thereby helping you lose calories. There are various pieces of cardio equipment available and you might have a hard time in finding the one that you want. So you get elevated body functions without having to resort to pushing or pulling heavy weights. In this review, there are several machines that give you unique benefits when it comes to cardio and you are encouraged to make a choice depending on what exactly you are looking for. After you’re done with this article, you will get a good view of what you should exactly be getting for your home or garage gym. 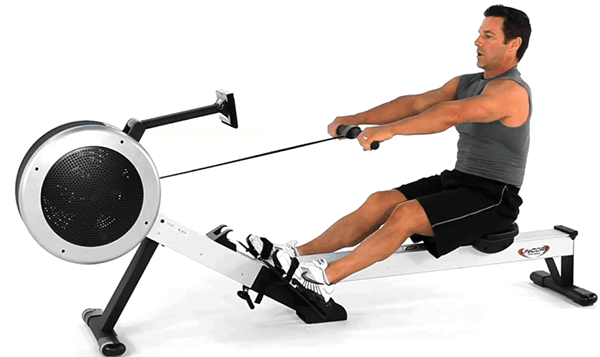 One of the most recommended and commonly used cardio equipment is rowing. Why? It helps in burning calories faster when compared to other machines. As per a study conducted by the Harvard University, doing a vigorous workout on a rowing machine can burn up to 377 calories in 30 minutes for individuals who weigh about 185 pounds. Besides the usual cardiovascular benefits, the rowing machine helps in toning your muscles. In this exercise, you are using all the main muscles of your body and putting a small pressure on your joints. This is because the act of rowing is low impact in nature. It is economical as well as convenient if you have a rowing machine in your home rather than going to the gym. There are many rowing machines that can be folded and kept out of sight. It is quite compact that you can do rowing exercise in front of the TV and after finishing the exercise, you can hide it. This is impossible with a stationary bike and treadmill. Read Our Best Rowing Machine Reviews 2019 Here. Treadmills have been around in the fitness scene a very long time. The only difference is now it has several advantages when it comes to application for the user like magnetic belt systems that cause less fatigue and accurate heart rate monitoring capabilities. This is also one of the easiest pieces of gym equipment to use. All you do is turn it on, press start, select your program or the speed/grade and you’re good to go. Modern treadmills have a lot of accessories like provisions for screen or reading that can make sure you aren’t bored while you're burning away fat on them. I feel that you cannot call a place gym unless there is one exercise bike. Check out the exercise bike. You can use exercise bikes as solo, with a stationary bike. However, the recommended and one of the best forms of cardio workouts is to ride the exercise bike as a part of a group or class. If you are thinking of buying an exercise bike for use as a cardio machine, you have to make sure that it allows many adjustment points. This is because; the more you adjust the bike to fit your body, the more comfortable your ride will be. And this will in turn help you to last longer on the bike, and burn a huge amount of calories. 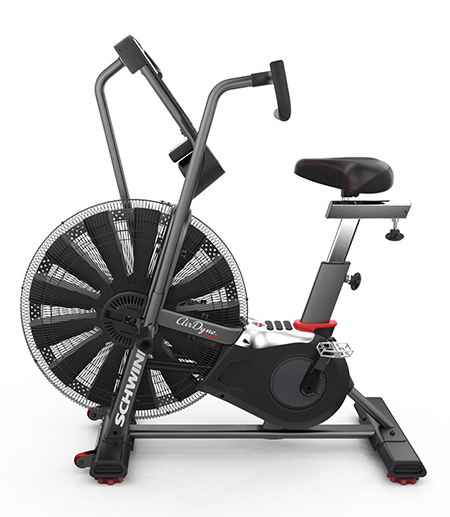 In addition, if you select an exercise bike as a part of your cardio workout program, you can decrease as well as increase the intensity of your workouts by decreasing or increasing the resistance of the bike’s pedal. It is important to keep in mind that as the exercise bike has got no backrest, you must not slouch and have to sit upright. Even though this is one of the best cardio machines, I wouldn’t recommend using it if your work setting involves you to being constantly seated. A standing machine is suitable for people who belong to such a work environment. Furthermore, you need to be careful and avoid overdoing your workouts on the exercise bikes, as if your hip flexors get tight, it may lead to problems with your posture. Read Our Best Exercise Bike Reviews For 2019. One of the staples of gyms all around the world, the venerable Airdyne has been one of the most deceptively hard machines to the newer gym bros. This uses the principle that air resistance is exponential and therefore gets a lot harder to pedal the faster you go at it. 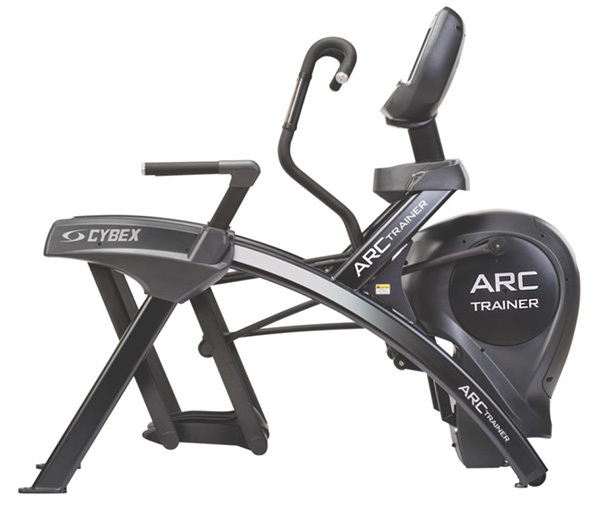 The newer version of this exercise machine comes with all new features including better ways to synch up with you and an RPM gauge so you can work through interval training. Needless to say, if you are looking for a hard workout then this machine, as unassuming as it looks can be a handful to deal with. You’ve been warned! Do you know what the best exercise for your gluteus maximus is? You guessed it right, hundreds of stairs. 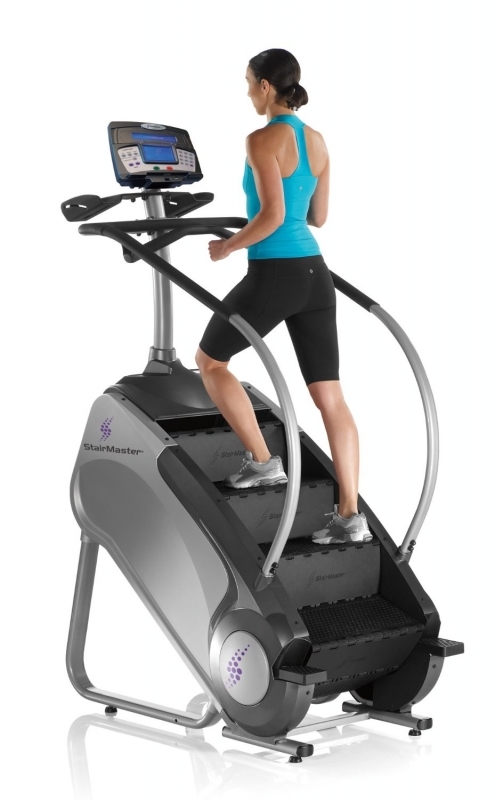 And what better way to summon an unending number of stairs than to opt for a stair master, also called stairmill. This infinite belt of steps will put the burn into your buns and get them sculpted in no time. A stairmill comes with handles but you shouldn’t rely on them too much as they dilute the workout. If you are looking for a cheaper alternative, then you can opt for the stair stepper. It might not offer the same kind of benefits as does a stairmill but at about 1/10 the price, it’s hard to complain. Plus it is a lot smaller and more portable than the big stairmill. 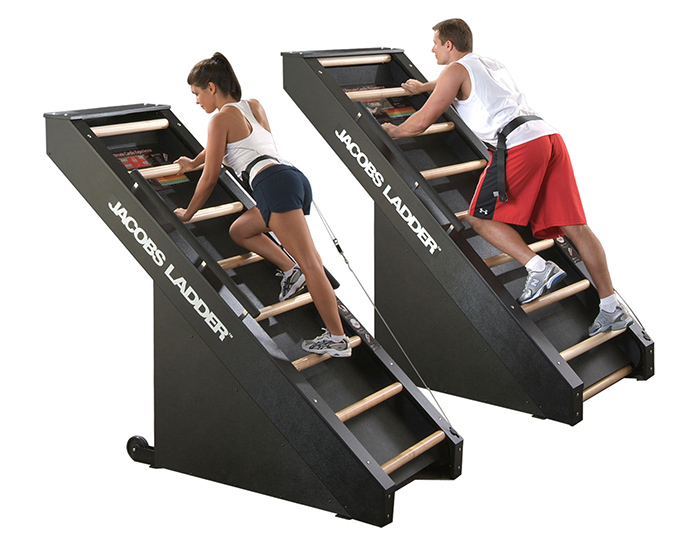 Named after the bridge between heaven and Earth, the Jacob’s Ladder provides you a thorough workout – upper and lower body. It is a considerably low-impact machine and has a high range of motion has made it a useful part of any person’s gym repertoire. The Jacob’s Ladder has a self-powered generator system that does not require an electrical socket. Putting into practice the spectacularly aerobic-endurance demanding movement of Nordic skiing into a machine, the SkiErg is a gym machine that you need to respect. This completely works the muscles in the shoulders, arms and upper body to give you that overall toned look to your body. It also accentuates the stabilizer muscles in your legs as well. If you don’t have enough room for a SkiErg in your home gym, you can opt for a simple exercise that uses dumbbells to replicate the same kind of movement. It works the muscles just as hard as the machine but you should take care not to swing too hard. Do you love climbing and wish that you could do that without mountains and all that safety gear and harnesses? Then you need to check this out. A treadwall is like a treadmill, but is a…wall. It has several points that you can hold on to and you can climb as high as you want without risk of injury. Climbing vertical surfaces is a full body workout and because it is also a non-impact exercise, people of all ages are able to get on it. If you are looking for a treadwall on a budget, then you can check out vertical climbers. 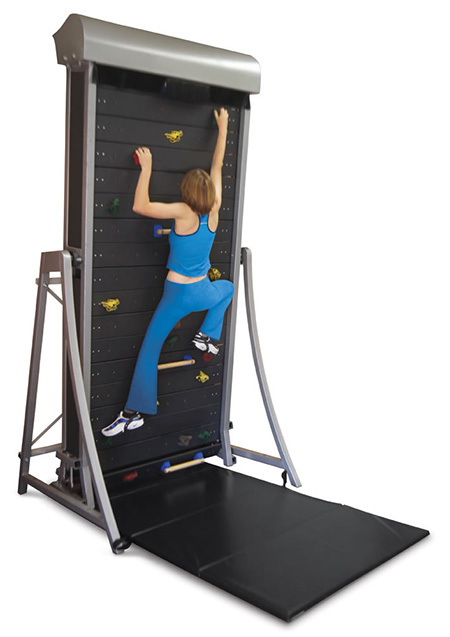 These mimic the actions of climbing but without the exorbitant cost or the large amount of space used by a treadwall. 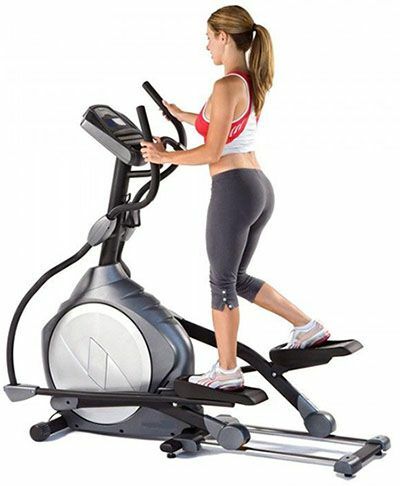 The elliptical machine or elliptical trainer is a famous exercising machine. It is often used for providing a non-impact kind of exercise for users. In a non-impact exercise, you don’t put a huge amount of compressive force on your bones and joints. There are various designs for elliptical machines. However, there are only two that are most often used – elliptical machine without any handles and one with handles. In the elliptical machine with handles, both your lower and upper body moves because of the concurrent pull and push movement. 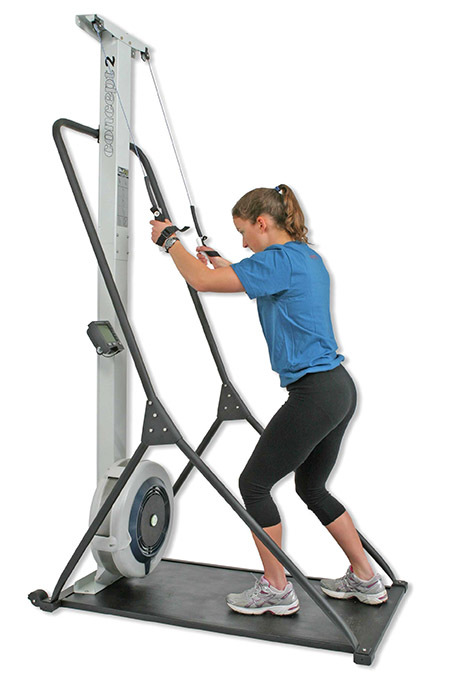 While exercising on such machines, the intensity of the exercise increases by adding more resistance. In the elliptical equipment without handles, you can adjust the incline level of the foot rests in accordance with the resistance level. Even though an elliptical machine is one of the best cardio machines, still you must not make this as the only regime of your cardio exercise. If all the cardio workouts are non-impact, then you could have a long-term health issue with regard to your bone strength and mass. Read Our Best Elliptical Machine Reviews 2019 Here. This machine is not what we would exactly recommend as the top tier when it comes to losing weight because it is ungainly and does not cater well to people of any height. If you have really dodgy knees you would probably be served better with this machine. Another machine which we don’t think is all that great for fitness, a recumbent bike only works out your legs and does nothing else. If you are recovering from an injury to your back and are not able to use other machines, then you might find this machine useful. Cardio is great, it reduces fat increases cardiovascular ability and generally is great for overall flexibility and fitness. But, it doesn’t change the fact that it is really boring unless you really change it up. So prevent boredom, you need something that can bring together the best of pumping iron and cardio machines. This brought about the rise of power cardio. What this basically does is combine fast movements with adequate resistance so you can burn off a lot of calories. You can build your own power cardio cycle. This is what we recommend to the beginner. Based on your results, you can change up different exercises so you get what you want. You can combine pushups with planking for the ultimate core and chest/shoulder burn. Plank for 10 seconds between 1 pushup. Do this for about 20 reps. Here, you can either choose to split jump or dumbbell lunge. I prefer alternating between 10 of each for a set. Split jumps are great for lower body flexibility and strengthening the hip flexors. Using low weight, a squat press combines strengthening the upper shoulder area and legs. It also improves your balance and gets rid of fat around your thighs. 15 reps in a set. Mountain climbers are one of the most dynamic ab/upper body exercises that are out there and so you need to make use of it. The good part of this exercise is that it doesn’t just focus on your abs alone, it gives your whole upper body a thorough workout. Go at it for 15 reps as well. Finishing it off with burpees is a bit hard I admit, but when you consider that burpees put all those muscles that you’ve worked out in the last few exercises into motion then it actually makes sense. Push as much as you can in this set and that is the end of the cycle. Rest a bit and then repeat. These are the best cardio machines of each genre that can work your body the best. While there are a lot more machines that can give your body a good cardiovascular workout, these were chosen for being durable, cost-effective and easy to use. But if you were actually looking for something that can help your body’s overall fitness, then you can’t go wrong with a rowing machine. It’s one of the best non-impact exercises available currently and can be used by people of all ages. So go ahead and take this opportunity to get your fitness levels up with a rowing machine! As stated above, these three exercising machine are the best cardio equipment. Each has their cons and pros. However, the rowing machine is more versatile and provides the best results. So, go ahead and select the way to row to awesome fitness.